5:00PM, IN THE WORSHIP CENTER. 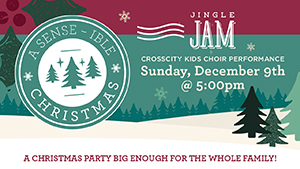 Join our CrossCity kids G3 team for an exciting Christmas party, big enough for the whole family! At CrossCity, we believe that childhood is an ideal time to discover and experience Jesus and His love. From the time that a child enters the nursery through the time that they move up to Junior High, children will learn to “Love God, Love Others, and Serve the World” while engaging in meaningful relationships, growing in Christ, and serving others. Come visit us in our fun, family-friendly facilities during our weekend services. We are honored to partner with you as your child journeys through the Children’s Ministry. We kick off the month with the greatest verse in all of Scripture, John 3:16. God loves the world so much that He wants to spend forever with us. That was made possible through Jesus! Bottom Line: God did something about our greatest need. Jesus was God’s gift to the world. We pray that kids start to understand their need for a Savior and put their trust in Jesus. Next, we look at Luke 1:26-56, when Gabriel came and made a huge announcement to Mary. God was about to rescue the world through Jesus, and she had an important role to play. Mary was overwhelmed by God’s love for the world and the part she got to play by fulfilling God’s plan to send a Savior. Bottom Line: God can use anyone to meet others’ needs. For whatever reason, kids may feel like God can’t use them to show others His love. We hope they see through the story of Mary, that God can use anyone to show His compassion to the world. In week three we head to Luke 2:1-7 to the familiar moment when Jesus is born. Even though Jesus was born where the animals stayed, God took care of all the details. The Savior of the World was born, and God’s compassion for us was on full display. Bottom Line: God gave us the greatest gift. God had been planning a rescue since the very beginning. Jesus was God’s greatest gift to make it possible for all people to be with God forever. As we head into Christmas week, we head to Luke 2:8-20 and find shepherds minding their own business and watching sheep in a field. Of course, we know what happened. Angels surprised them and announced that the Savior of the world was born. The shepherds were so excited they ran to meet Jesus and spent the rest of the night spreading the good news that Jesus was born. Bottom Line: Share the good news about Jesus. 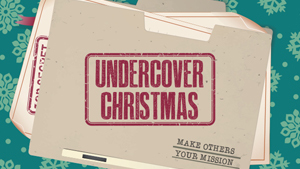 This week we want kids to start thinking about how they can share the good news about Jesus. From the words they say to the life they live, they can point people to Jesus and show God’s love to others. Join us Monday night for a moving service that will calm your spirit and center your heart and mind. Our 3 identical services will include a time of worship, an unforgettable message about the birth of Jesus, and end with a beautiful candle lighting ceremony. A fun and meaningful time for the entire family! *Childcare for Nursery through 3 years old will be available. Elementary through High School Students will stay in the main service. We finish our month on compassion in 1 John 4:9-12, where we read about God’s great love for us when He sent Jesus to pay the price for our sins. John reminds us that no one has ever seen God, but when we show love to others, people see God through us. Bottom Line: Love others because God loved you first. This week, we want to help kids connect their compassion to the source of compassion. We show love to others, not just because it’s a good thing to do, but also because it’s what God did for us and what God calls us to do for others.